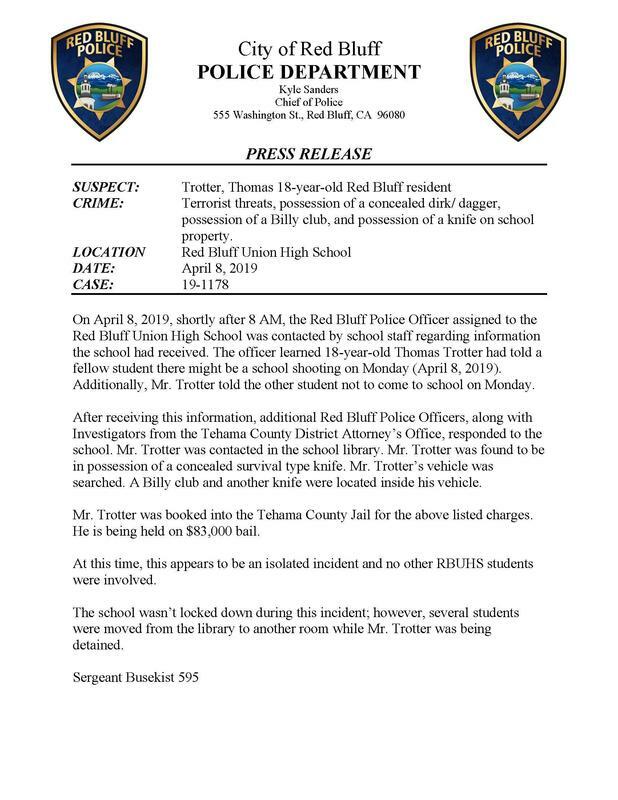 On April 8, 2019, shortly after 8 AM, the Red Bluff Police Officer assigned to the Red Bluff Union High School was contacted by school staff regarding information the school had received. The officer learned 18-year-old Thomas Trotter had told a fellow student there might be a school shooting on Monday (April 8, 2019). Additionally, Mr. Trotter told the other student not to come to school on Monday. 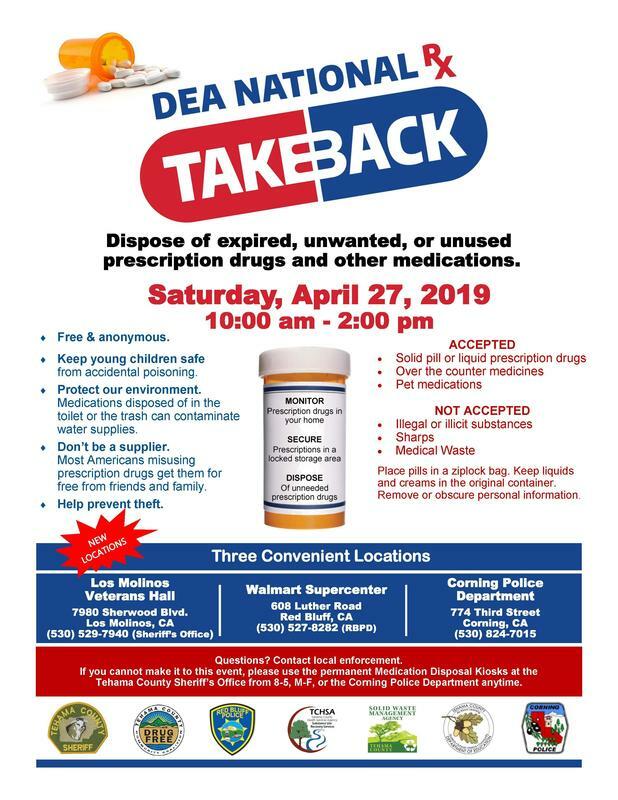 After receiving this information, additional Red Bluff Police Officers, along with Investigators from the Tehama County District Attorney’s Office, responded to the school. Mr. Trotter was contacted in the school library. Mr. Trotter was found to be in possession of a concealed survival type knife. Mr. Trotter’s vehicle was searched. A Billy club and another knife were located inside his vehicle. Mr. Trotter was booked into the Tehama County Jail for the above listed charges. He is being held on $83,000 bail. 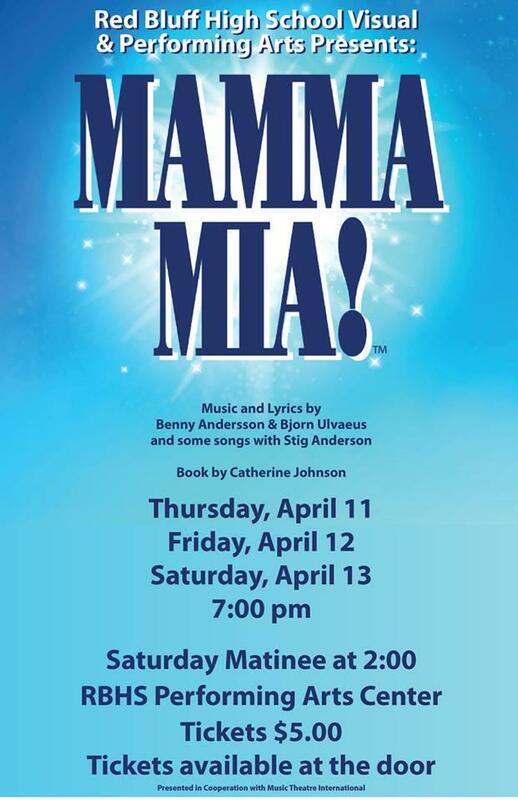 Red Bluff High School Visual & Performing Arts Presents MAMMA MIA! Tickets are $5 and available at the door. In accordance with Education Code Section 5091, the Red Bluff Joint Union High School District will appoint one (1) representative to fill the vacancy on their Governing Board. Candidates who are interested in applying must be a resident of the Red Bluff Joint Union High School District and a registered voter. Anyone who is interested in applying for the 18-month term should request a packet by calling the District Office at 529-8700. Candidates need to submit their request for consideration to Todd Brose, Superintendent at 1525 Douglass Street, Red Bluff, CA 96080 by April 30, 2019 before 4:00 p.m. 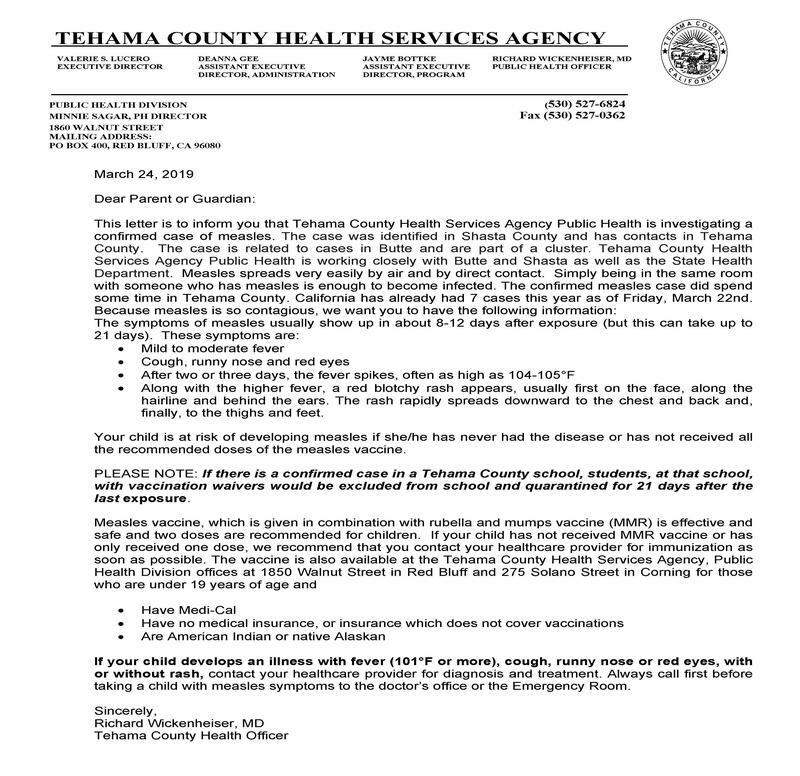 Interviews will be held and an applicant will be selected at a special board meeting on May 7, 2019 at 6 p.m.
Tehama County Health Services Agency Public Health is investigating a confirmed case of measles. In this edition of Spartan Speaks we take a look at what makes the Kiwanis Holiday Classic such an exciting and popular event. This edition of Spartan Speaks features District LCAP Goal #3: A commitment to improving, supporting, and sustaining student engagement with a positive and safe climate.